Oh how I love these little guys! Lets backtrack a little. In my part of the world corn dogs are unheard of. I've always been eager to see what the fuss was all about each time I'd read about them. I really should have tried making them myself sooner. I don't know what I waited all this while for. But I'm glad I finally did. 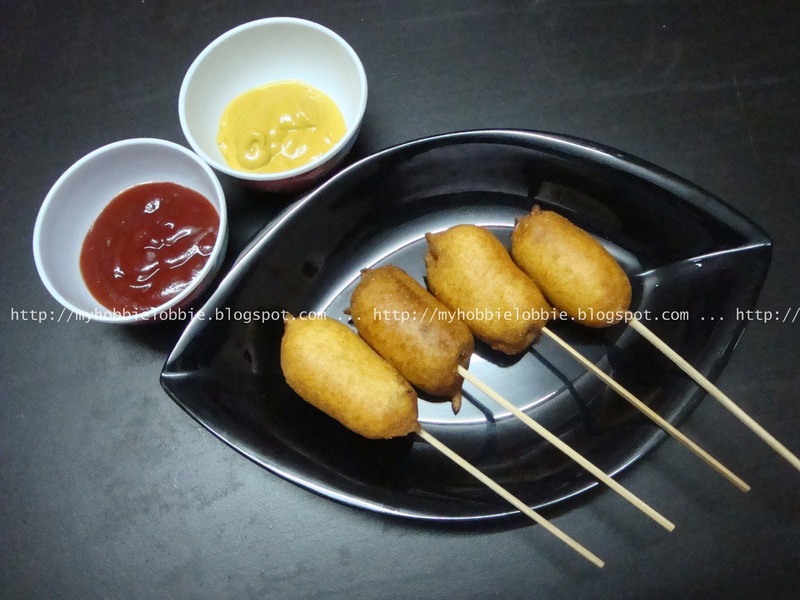 These corn dogs are so simple to make, you can serve them up in minutes, literally. They taste so good. I really can't compare them to the frozen variety because we don't get them here. But I do hope one of you tries these out and lets me know how they stand compared to their frozen counterparts. I'm so glad to have this recipe in my arsenal. I can't wait to serve them up when we have company. I didn't make too many changes to the recipe since I didn't know what to expect. For the next time around, I will use lesser sugar. I found the sweetness coming through a little too much for my liking and seeing as to how I like my food a little spicy, I added some red chilly powder and some black pepper powder and I'm really glad I did. You can leave it out if you don't like too much spice. I served them up with some ketchup and mustard, do each one could choose what condiment they wanted. Mix all the ingredients for the batter (leaving out the last 3) and that includes 1/8 cup of oil. Start with 1/4 cup milk and mix well. You need to gradually add more milk if needed till you get a batter thick like a pancake batter. If the batter is too thin, it'll fall off the hot dog. Mix well making sure there are no lumps in the batter. Pat the hot dogs dry with a paper napkin. Dip the hot dogs into the batter and carefully deep fry them in hot oil. Fry them on medium flame till golden brown on all sides. Take them out of the oil and place on some kitchen paper. Carefully insert the wooden skewers into the corn dogs. Serve these up hot with some ketchup and mustard. Enjoy!!! A very delicious and yummy looking corn dogs. Wonderfully prepared dear. Thank you Alpana and Dzoli! I could go for these, right now. They sound absolutely delicious. They will be featured tomorrow at My Meatless Monday. I hope you will drop by and you are always welcome to bring more recipes. Your Corn Dogs look incredible! Corndogs are one of my alltime favorites. Thank you for sharing this delicious recipe with the Hearth and Soul Hop. Thanks Alea, its a pleasure as always! Who knew you could make a homemade version of what I remember seeing at the grocery store when I was little and begging my mom to buy, and which she would allow on occassionnn. This recipe sounds delicious, and based on the picture, they turned out great!